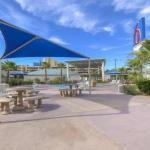 Set in a great location a block from the Strip near the Tropicana and MGM Grandwith free parking a heated 24-hour pool Motel 6 Las Vegas Tropicana is a popular choice among our guests. Billed as the largest Motel 6 in the world the hotel has 600 guestrooms in a two-story motel complex with exterior corridors. Rooms come with private bathrooms air conditioning and cable TV with HBO. Wireless Internet is available for a small fee. Swim in the morning swim in the afternoon and swim in the evening or even in the middle of the night if you want. That's because the heated pool is open 24 hours. There's nothing wrong with lounging poolside on the attractive landscaped deck either. The hotel also has coffee in the lobby 24 hours a day and free parking. The Motel 6 Las Vegas Tropicana is at E Tropicana Avenue and Korval Lane 1.5 blocks east of the Strip. The neon lights and nonstop action is calling you. The nearest casino resorts are Hooters and the Tropicana. The lions and live entertainment of MGM Grand the roller coaster at New York New York and medieval joust at Excalibur are all nearby. McCarran International Airport is two miles and the Las Vegas Convention Center is three miles. Downtown Las Vegas is seven miles north.